Typically, when a Forex trader closes a position, the outcome is either positive (gain) or negative (loss); the breakeven trades happen but are quite rare and uninteresting. Trading platforms usually display the outcome as the value in pips or currency units, or both. Detailed account reports can also show them in percentage to the account balance at the moment of trade’s liquidation. Some reports also produce complex risk-adjusted metrics based on several trades, e.g. Sharpe ratio. 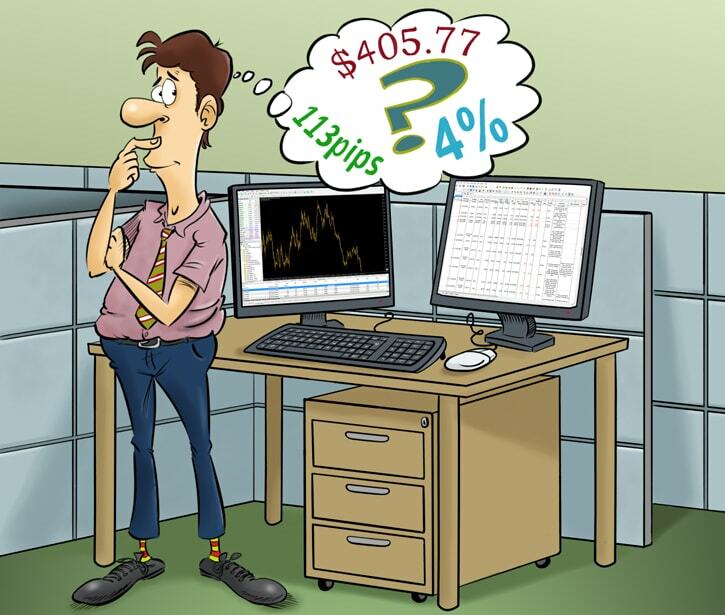 However, traders (especially newbies) often use only pips and dollars to count their wins and losses. They have a point because both metrics are very useful and have their pros. But should a currency trader who aims for success look at only these two popular measures? Pips — the plain difference in open price and close price of a given position. A good thing about pips is that they let you compare trades easily without the data being spoiled with position size and other parameters. The bad thing is that pips are mostly incomparable across different currency pairs. Also, this number alone, unfortunately, tells nothing about how much money the trade has brought you, how does it relate to the risks you have taken, and how big of a leap for your total account balance this trade was. Dollars (or other currency) — a plain, informative, and tangible measure of the trade’s success. After all, earning money is every trader’s goal when they start buying and selling currencies. The benefit of using this metric is obvious. The negative side is that it makes impossible to compare strategies on accounts of varying sizes. It also tells you little about how much you risked to get that amount of USD (or EUR, or whatever). Were you scalping for 3 pips with a 5-pip spread on a currency pair? You will never know it from the dollar value alone. Percentage points (%) — turning your profit or loss into percentage points (relative to the risked amount, account balance, starting deposit, or anything else) makes things much more comparable. With percentage points, you can even compare your performance as a Forex trader to non-Forex benchmarks, like equity markets or bonds, or your local bank’s certificate of deposit. Unfortunately, unless you calculate it relative to the risk amount, it still tells you nothing about how precarious your trading was to accomplish this gain. R-multiples — they tell you how many risk values have you won or lost. For example, if you risked $100 to gain $200, then you have won 2R. Or, if you intended to risk $100, but your stop-loss has failed big time and you lost $1,000 instead, your R-multiple loss is 10R. R-multiples were introduced by Van K. Tharp in his book Trade Your Way to Financial Freedom. They are great because they allow traders to focus on relation between what they earn and what they risk, turning the focus away from the pips, $, %, and other symbols that are mostly irrelevant when testing and comparing strategies. Of course in real life, traders are too interested in other metrics to be satisfied with R-multiples alone. Risk-adjusted return — a more complex look at your Forex performance. The financial investment industry’s standard is the Sharpe ratio, which discounts the excess ROI using its volatility (standard deviation). In foreign exchange trading, it looks more prudent to use the Ulcer index. Unlike Sharpe ratio, it does not include positive peaks in addition to the negative troughs in its formula. In any case, risk-adjusted return can only be measured on a series of trades if you want to produce reliable and informative data. Being rather helpful to know, it also give little information as a stand-alone metric. You will also need some analytical software to find out the values of the risk-adjusted return metrics. MetaTrader 4 and MetaTrader 5 report the Sharpe ratio in detailed statements. The Ulcer index can be calculated using our free report analysis tool. My primary metric, the one I look at most often, is the percentage gain or loss. I pay attention to my dollar wins and losses. Sometimes, I glance at the pips. I almost never use R-multiples, but from time to time I do calculate my risk-adjusted returns over a yearly period. And how about you? How do you measure profit and loss? If you want to share more details on how you measure your Forex trading gains and losses, please post them using the commentary form below. Your blog post was great. It’s a perfect example of a short blog post that provides value. If I should add an aspect how I measure my trading success/progress, I like to go back and evaluate all my entries and exits on finished trades once a month. After doing this some time I see what I could/should improve. I’ll share this blog post to my Twitter followers on Thursday.